The Irish Flute Combo starts with one of my Standard Flute models in D with rings and slides as the core flute. Additional middle joints and a foot joint are used to convert the flute to play easily in the keys of C, Eb and E, depending upon which joints are used. Since these flutes play diatonically, the keys that are easy to play in with this setup are D/G, C/F, Eb/Ab and E/A and their relative minors. D Middle and Foot Joints. This Foot Joint is used also with the C Middle Joints. How does this compare to a keyed flute? It is possible to play all of those keys on a keyed flute and many players take that route. However, using keys to play in key signatures other than D and G is awkward and requires a long learning curve. The Irish Flute Combo allows one to play the natural diatonic fingerings at different pitches. Thus music learned in one key is easy to play in these other keys. It is pretty much the same concept as having whistles of different pitches to play. It makes sense if you are going to play something in Eb to have a flute that plays in Eb! Irish Flute Combo Retrofits: If you already own one of my Standard Flutes with rings and slides, keyless or keyed, the Irish Flute Combo Retrofit Package can be ordered and fitted to your flute, expanding its capabilities. Hand sizes and alignments. The core D flute for the Irish Flute Combo is available in Standard, Small Handed and Large Hole Standard configurations, either with the ergonomic finger hole alignments described elsewhere on my website, or in-line. The finger hole spacing for the C body is set at 33mm between holes (measured center to center) but can be made a little closer if necessary. The E and Eb bodies are narrower than my Small Handed flutes but work fine for larger hands. These can all be made with the ergonomic offset or in-line finger holes. What about keys? Keys still may be added to the Irish Flute Combo bodies as desired, at $450 per key. 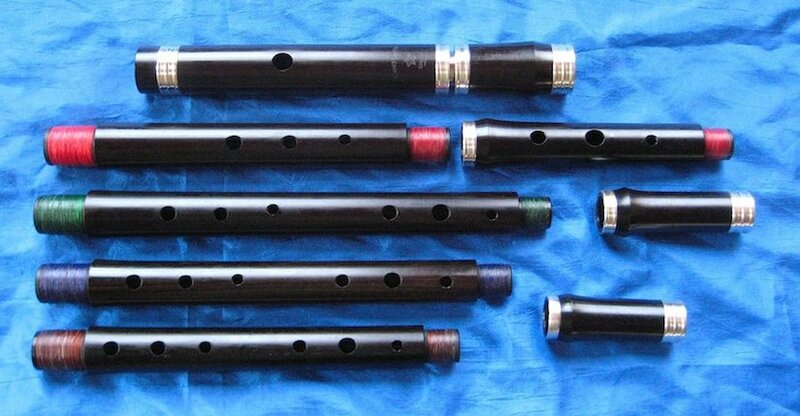 You may wish to have the 4, 5 or 6 keyed configuration on the D flute core. I find the idea of the C flute having keys particularly intriguing. Is the tuning slide necessary? I have made my Low Combo flutes in A, Bb, B and C for several years. I find that having a tuning slide is useful when going from one setup to another. Certain scalings will respond differently to different players. Thus if the D setup plays in tune, sometimes the C will need to be pulled out a little more, or the Eb and E pushed in a bit. It is just good to have that tuning flexibility and in this instance I am making it a requirement. Is this available for the Folk Flute? Or my Standard Flute? For Folk Flutes, no. If you own one of my retrofittable $700 Standard Flute models, you can get the retrofit package. However this also requires you to order the Rings and Slides retrofit for an additional $400. Regarding retrofitting older Casey Burns Flutes: If you ordered your flute sometime after the year 2000, most likely your flute is retrofittable. Before then my scalings were in somewhat a state of flux. If you are interested, contact me. I might require you to send me your flute so I can evaluate whether or not the retrofit is possible. In most cases, the retrofit is possible. What woods are available? Currently the Irish Flute Combo is available in Blackwood and Boxwood. I do not have any ready to use Mopane currently, but hope to have it available by the Fall of 2015. This is also the case for retrofits. Note that you can also mix and match woods! A Blackwood retrofit for a Mopane D flute would be entirely acceptable. 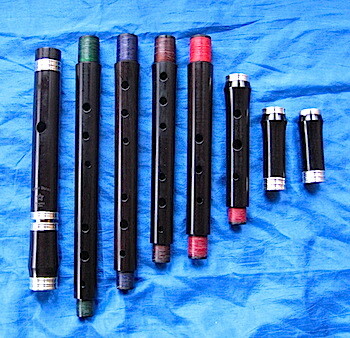 In the above images the Irish Flute Combo is set up as 4 different flutes: C, D, Eb and E. Use the head joint for scale. Hand sizes and alignments. The core D flute for the Irish Flute Combo is available in Standard, Small Handed and Large Hole Standard configurations, either with the ergonomic finger hole alignments described elsewhere on my website, or in-line. The finger hole spacing for the C body is set at 33mm between holes (measured center to center) but can be made a little closer if necessary. The E and Eb bodies are narrower than my Small Handed flutes but work fine for larger hands. Holes can be ergonomically offset or in-line. I started addressing the needs of smaller handed players as far back as 1985, and iteratively developed flutes that are comfortable to one's hands with the narrowest finger spacings available in the Irish Flute market. These are the distances between fingerholes (measured center to center) range from 32 to 35mm on my Standard D flute, and from 29 to 32mm on my Small Handed Flutes. Holes are usually offset for further comfort. How do the other piches play in comparison? For some time I have been making flutes in C using my Low Flute head joints with the larger 21mm bore. Recently I developed a C flute that uses my D flute head joint and foot joint that plays better. The bore is similar to my Rudall flutes, based on a later Rudall Carte, that feature two vent holes on the foot joint. These would play reliably down to the C if I made them with the keys for these two bottom holes (I don't!). By rescaling the finger holes downward I was able to make this flute work in this pitch. The C flute plays very evenly with a warm, rich tone, just like my Rudall model D flute. The higher pitches Eb and E remain rich but are increasingly lively the higher the pitch. The narrower fingerhole spacings also make them faster to play. Bottom line - these pitches are just fun! The E body is especially useful for playing fiddle tunes in the key of A. Just to dispel any confusion: Modern Flutes are called "C Flutes" by most players. We call our normal Celtic flutes "D Flutes". In reality these are all the same type of instrument pitch-wise, in that the note sounded with all 6 primary finger holes covered is D just above middle C. The modern flutes are called "C Flutes" because written C sounds the note C. Traditional musicians commonly don't even read music and it is more useful to know what key one is actually playing in. Thus we call our Celtic flutes "D flutes." Thus with the Irish Flute Combo, the C flute setup plays in the key of C, and so forth. How to order: When you order your Combo or Combo Retrofit using the Buy it Now buttons below, you will be placing a 25% deposit only. The balance including shipping will be due in the weeks just before I complete your instrument. I will contact you to request the balance then. You can also mail in your deposit via check in USD. For retrofitting, I will need your instrument on hand and will contact you with details. Order the Irish Flute Combo now using your Credit Card or PayPal account. PayPal is my online credit card transaction provider. It is free to you, secure, and for credit card purchases, does not require a PayPal account. Usually PayPal will automatically issue an acknowledgement of the transaction. If you don't receive one, check with me to verify that the order has been recieved. Price for the Irish Flute Combo: $2000. To order, you will pay a 25% deposit of $500. Price for the Irish Flute Combo Retrofit: $900. To order, you will pay a 25% deposit of $225. Shipping: Shipping will be determined at time of ordering. I ship all flutes via the US Postal Service and Endicia, and insure these for full value. International orders are also declared at full value. Any duty or sales tax (VAT/TVA) is your responsibility. Consult your local authorities. Delays in Customs processing are not my responsibility. If an invoice is needed for accelerating such processing let me know. Wait time as of 22 Apr 2019: Generally I prefer to keep my wait times to a minimum, usually less than 90 days. Currently a Combo or Retrofit ordered in April would be finished in late May or June. If you do not wish to order your Combo or Retrofit package with PayPal or Credit Card: Please e-mail me with your purchase request to arrange payment details. For US Customers I accept personal checks and money orders; For International Orders, I accept only secured payment methods in US Dollars. Orders will ship after funds are verified.